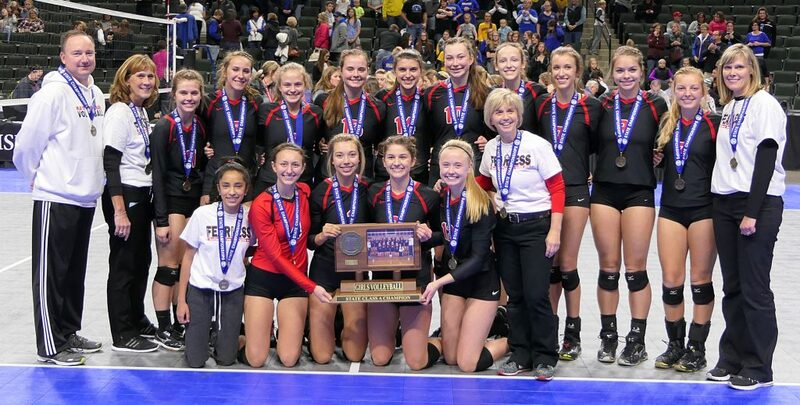 The Mayer Lutheran volleyball team topped last season’s state championship by winning another one this year. They did not lose a single match to a Class A school, finishing the season with a 31-2 record, losing only nine sets over the course of the entire season. The only two losses were to AA champion Maple Lake and AAA runner up Eagan. In going undefeated in the Minnesota River Conference, seniors Maddy Hucky, Madi Beck, Sophie Heuer and Mya Chmielewski were named All Conference, while Olivia Tjernagel was named Honorable Mention All Conference. At the state tournament, Madi Beck, Maddy Hucky, and Sophie Heuer were named to the Class A All-Tournament Team. Additionally, Maddy Hucky, Sophie Heuer and Mya Chmielewski were named to the Class A All-State team. To see more photos and articles about the volleyball team, visit our Facebook page (https://www.facebook.com/mayerlutheran/) and scroll through our recent posts.